Pickles are one of my favorite ferments! In this video, you'll see beautiful fermented Garlic-Dill Pickles. They are so easy to make at home. These are NOT your regular vinegar pickles you'll find in the grocery store. Instead, these are fermented with salt. Once pickled, there's an explosion of vitamins, enzymes, probiotics, beneficial acids, and most importantly… a delicious crunch! These are so good, and they're really easy to make! By the way, in the video I mentioned this FREE Fermenting Formulas Cheat Sheet — it's a gift from me to you. Here's a link to grab it. 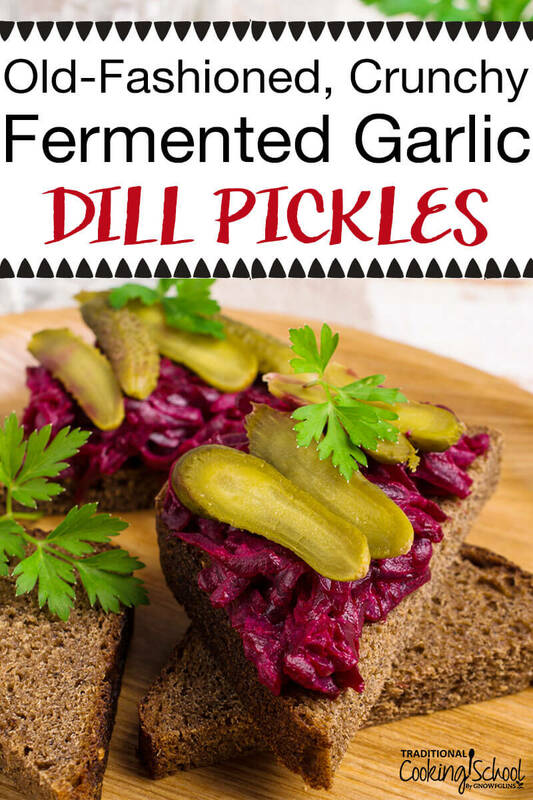 These pickles are fermented with salt for an explosion of vitamins, enzymes, probiotics, beneficial acids, and most importantly... a delicious crunch! Makes 1 gallon pickles in this 1-gallon stoneware crock from Ohio Stoneware. Submerge cucumbers in cold water for 10 to 30 minutes to crisp them up. Meanwhile, make the brine by combining the water and sea salt. Stir well to dissolve the salt. Cut the ends off each cucumber. Start packing the crock with cucumbers. Every so often, sprinkle in some dill seeds, a few cloves of garlic, and some black tea. If you'd prefer, omit the dill seeds and garlic and add celery seed or peppercorns, etc. instead. Keep packing the cucumbers, stopping to sprinkle more of the other ingredients along the way. When the crock is full to within 3 to 4 inches of the top, stop adding ingredients. Pour the brine over all of it so the cucumbers are submerged. Place the stone weights on top — they will make sure the cucumbers stay below the surface of the brine. Add the lid of the crock. When they are done, remove the lid and plates/weights. It is completely normal to see bubbles at the top and also for the brine to get cloudy. Taste your pickles! They should be crunchy and salty. They may not be fully pickled through the entire cucumber but that's okay. They'll continue to "pickle" in cold storage. Transfer to a gallon sized glass jar and store in the fridge. You can eat them right away or let them age longer in the fridge. Enjoy! 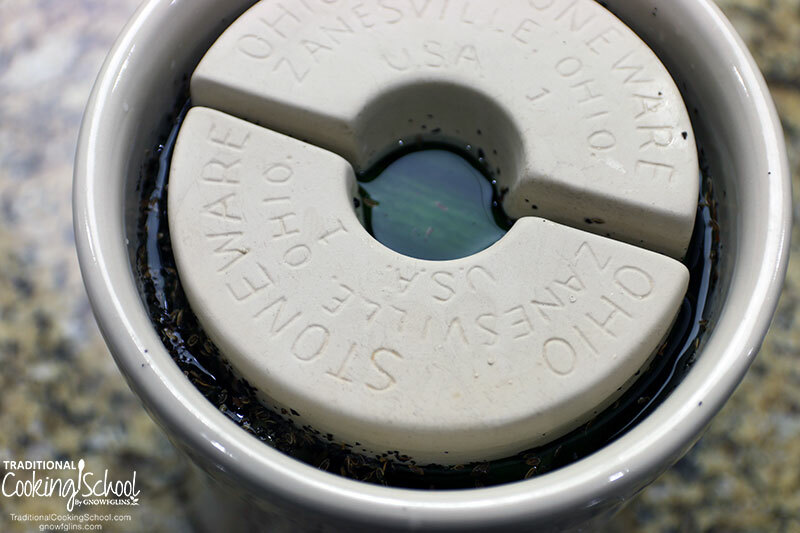 I used the 1-gallon stoneware crock kit from Ohio Stoneware in this demo. Hands down, it's one of my favorite kitchen tools. We ferment in it all the time — sauerkraut (video demo and recipe here), pickles, kimchi, and more. 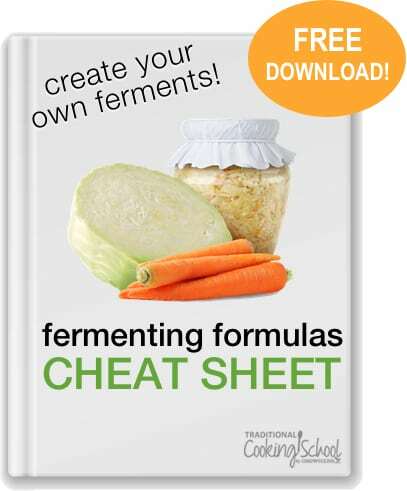 If you like this, then you'll love my Free Fermenting Formulas Cheat Sheet. It's a free gift for you. It's where I share formulas for all kinds of ferments, beverages and salsa and kraut and pickles and relish, oh yes. So you can create your own safe to eat, delicious, yummy, healthy, fermented foods. 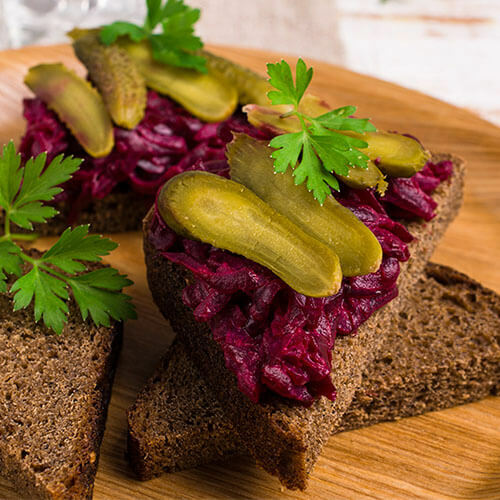 Have you made old-fashioned fermented pickles? What are your favorite add-ins? This post was featured in 60 Easy and Nourishing Picnic Recipes. Can you use fresh dill? What about fresh sliced jalepenos? Thanks!! is it necessary to use the stoneware to ferment in? I’ve had the greatest success in using the Fido fermentation jars from Italy, purchase through crate and barrel. I never have to burp or open the jar once it begins to ferment, Whether it’s one day for mayonnaise or five weeks for sauerkraut! So my question is, what I pack my Fido 2 1/2 L jar the same way your recipe calls for packing the stoneware gallon jar? And with the fermentation time be approximately the same? Thanks for all your great information, I am fairly new at fermenting, but enjoying the adventure! Hi there Millie Cooper. I was pleasantly surprised to see a photo of you next to the responses to questions asked. 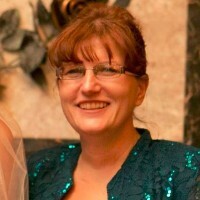 Now I know whom I am chatting to when I sent in all my questions. Love your blue jacket. I’m going to do this, I normally pickle with vinegar, it seems I remember my grandparents had a huge crock in the kitchen full of pickles all the time, era 1950’s. Great article! I have a 2 gallon Ohio stoneware crock. Can I use it for smaller batches as long as the brine covers the cucumbers and the stone weights hold them down? Can you use Horse radish leaves if so how big and how many? Yes, you can! Use a few larger leaves per quart jar. These are a good flavor but rather salty. Could I use less salt? The salt is essential for fermenting safely and properly. A certain amount is required to protect the lactobacilli and repel spoiling organisms. If you wish to reduce the salt, make sure to use a starter culture, and also don’t reduce too much! If my pickles are large can I cut them before fermenting? Hi… I have tried this once and it did not turn out… th pickles were soft an unappetizing. I am not sure where I went wrong. Temperature in my basement is around 70F. Is this too warm? would even give the desired flavor. Just seems like there should be a way to get the best of both worlds. Hi, Michelle. Are you talking about white vinegar or apple cider vinegar? I can’t really say whether or not the good probiotics would suffer or decline in the presence of apple cider vinegar (or perhaps they would shift in concentration?) but I suspect that white vinegar would cause a decline due to it’s anti-bacterial properties. I really don’t know for sure though, perhaps they would be fine unless heated. I’m sorry I can’t help more! Thank you for your response! I was/am thinking about using apple cider vinegar because of it’s great health properties. I would rather not use white vinegar. I have a bunch of fresh cucumbers from the garden so I think I’ll half this recipe and try adding ACV after the ferment and see what he thinks. I will have more cucumbers coming so I can always make up some more if they don’t turn out. Thanks again! I did find a recipe for lacto fermented hot sauce that adds vinegar after fermenting and blending. I will probably use my unfiltered apple cider vinegar, just a little. Do you use fine or coarse grain sea salt? Also, can you use the brine from a previous batch of pickles as a starter culture in place of some of the salt? If so, how much brine and salt would need to be used? Is it ok to cut the cucumbers first? Cut as is you quartered or sliced into chip sizes? Would doing so cause them to ferment more quickly or spoil more quickly? Yes, you can definitely cut them first. The smaller the cut the quicker it will ferment. Each ferment is different depending on time and temperature so each ferment will last different times in the refrigerator. I usually do a small batch if I am trying something new to see how I like it and gauge how long it will last.